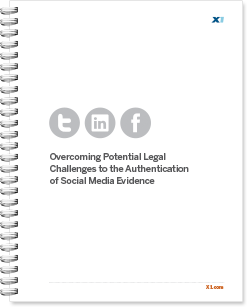 Social media evidence is highly relevant to most legal disputes and broadly discoverable, but some challenges lie in evidentiary authentication without best practices technology and processes. This whitepaper examines these challenges faced by eDiscovery practitioners and investigators and illustrates best practices for collection, preservation, search and production of social media data. Also highlighted in this paper are examples of numerous unique metadata fields for individual social media items that provide important information to establish authenticity, if properly collected and preserved. Learn more by downloading the complete whitepaper now. Please fill out this brief form below.